You certainly can’t accuse Jake Quickenden of resting on his laurels. After getting knocked out of the X Factor in 2012 before the live finals, he returned two years later for another crack. And although he only made it to week three of that year’s live finals, he has proved to be adept at keeping himself in the public eye, with stints in I’m A Celebrity...winter sports-themed reality show The Jump and emerging triumphant on last year’s Dancing on Ice. There have also been plety of guest spots on the likes of Lorraine, The Wright Stuff and Loose Woman . He’s now about to star in The Kings Theatre’s Cinderella as The Prince – after he made his panto debut a year ago. But his most recent stage appearances, including a night at The Kings back in June, have been a little bit less family friendly – he’s been part of the male strip-dancing group, The Dreamboys on tour. ‘I won’t be taking my clothes off this time. That’s definitely something that won’t be happening in this show!’ chuckles the hunk, speaking to The Guide at The Kings for the panto’s launch. Scunthorpe-born Jake made not only his panto debut, but his acting debut when he took the title role in Peter Pan at the Opera House in Blackpool, and he was more than happy to do it again. And he’s looking forward to his time here in the city – keep your eye out as the down-to-earth performer likes to get out and about when he’s somewhere new. ‘I haven’t had the chance to look around yet, but everything I’ve seen so far is really nice and everyone’s been really friendly. I’ll be looking for somewhere to have a drink – when I haven’t got a show, of course! After his first appearance on X Factor, Jake refused to be downhearted about it. He went away, regrouped, and tried again. But he admits that it was tough at first. ‘I didn’t really know what I wanted to do, I was just gigging and on the dole. I was living at my mum’s and trying to do something that I love to do. My dad always said do something that you love, you don’t need to be earning millions of pounds as long as you’re doing something you makes you happy and you’re enjoying it. Yes, Dancing on Ice, saw Jake and pro-dance partner Vanessa Bauer lift the trophy on ITV’s revived reality show. But it was all new to Jake when he signed up. ‘I’d never done any ice skating – it was my mum’s favourite show – she was more excited than I was when I said I’d got it. 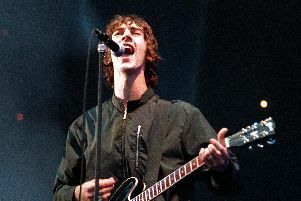 He’s hoping to get more back into his music at some point too – he’s actually been recording a new album here in Hampshire. ‘I’m back in the studio now, as we speak actually. I’m writing all my own stuff and helping produce it. ‘I got to sing at the end of Loose Women the other day, just a few lines, and the number of people who were saying things like: “I didn’t know you could sing!”’ he laughs. While chatting to the likeable lad, you get the impression he really is just making the best of what comes his way, and enjoying it. But it has made him a tabloid staple, particularly with regards to his love life. ‘It’s mental really, I’m still the guy from Scunny who worked in McDonalds, all my mates are back home, I go to the same pubs back home, I try not to go to many celebrity parties, I’m not really bothered with that kind of thing. ‘I find it weird that people care about what I’m up to, or give a damn about what’s going on in my private life – I do try and keep my private life private. But it comes with the territory, if you do a TV show, you’re going to get it and that’s just one of the side of it. The other side is that I get to do all these amazing things with amazing people and do what I love for a living. So yeah, it comes with pros and cons. Jake is joined in Cinderella by Marcus Patrick, Natasha Barnes, Jack Edwards, Simon Grant and Kaya Rose in the title role. It is at The Kings Theatre in Southsea from December 11 to January 6. Tickets from £17. Go to kingsportsmouth.co.uk.